Walker Falls model railway layout is an On30 layout by Thistle Modelmakers Model Railway Club in Edinburgh.It represents a fictitious station & logging line somewhere between North Conway and Castine in the New England area of North America. The station is reached by a single track mainline with a small yard serving the switchback leading to the mountains and the logging camps. The layout is operated using the Lenz Digital Command Control system by both hand held and computer control possible. This includes control of the lights, sounds and smoke units in the locomotives! 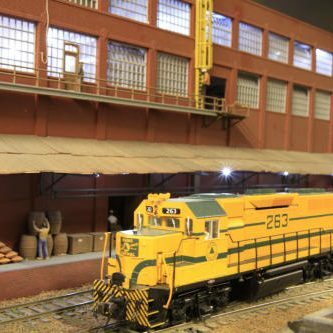 This allows the operators time to answer any questions that fellow modelers or members of the public may have on the construction process. 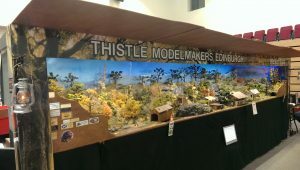 The highly detailed models in use and/or the DCC set-up we use. Look out for the many “creatures” and cameos, including working/animated scenes like the waterfall, rabbits, rocking chair, water tower, door, windows, carpenter, painter, flag, lumberjacks, hunter and moving sign to name but some! 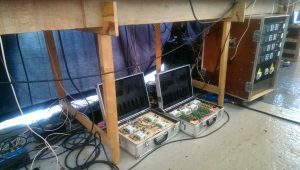 We also have a 2 day (1 hour) sound track with the various day to day noises linked via our DMX system with the animated scenes and a fully automatic lighting sequence which covers buildings, layout lighting (Day & Night)…….….and the weather!!! Is that clouds with thunder & lightning?? YES it is! !